General Hospital (GH) spoilers tease that one twin will be revealed as Jason Morgan by the end of the week, December 1. That means the other one is the mysterious Andrew Cain. GH hasn’t offered much about Drew’s background. They’ve only provided a few tidbits from Betsy (Deborah Strang) and Kim (Tamara Braun). Unfortunately, neither one of those women can be trusted. Betsy lied several times and is a little off her rocker anyway. As for Kim, GH fans don’t know her very well yet. Her reaction to Patient Six (Steve Burton) was quite bizarre and she couldn’t hide her uneasiness around Jason (Billy Miller) either. Some of the basics Kim gave must be true. The San Diego and Navy SEAL details fit with everything else we’ve seen and also provide a way to access BM Jason’s fingerprints before he came to PC. However, it’s clear that Kim’s holding out on us. She undoubtedly knows more than she’s letting on. Kim previously hinted to Oscar (Garren Stitt) that his father wasn’t a good guy. She spoke fondly of Drew during her chat with Carly (Laura Wright) and Sonny (Maurice Benard), but maybe she left out something important. It’s possible that Drew had a violent side when he became angry. That might be why Kim’s so paranoid about Oscar connecting with his dad. Betsy also claims Franco pushed Drew down the stairs when they were kids, but she only saw the aftermath. What if Drew was the menace who started the scuffle? Franco might’ve fought Drew off and forced him to take a tumble instead. It could’ve been a case of self-defense for little Franco – even worse, it could have been Drew who pushed Franco down the stairs in a malicious ‘Bad Seed’ action. Drew later took the last name “Cain,” which could be another clue about his violent streak. The Bible tells the story of vindictive Cain and obedient Abel. When Cain could no longer control his rage and jealousy, he murdered his brother. It’s obviously no coincidence that GH chose Cain as a last name for Drew. They may be hinting at what Drew tried to do in the past and what he might try to do in the future. General Hospital spoilers suggest strongly that Billy Miller’s character is likely Andrew, which makes sense. After all, he’s threatened to kill Patient Six on more than one occasion. 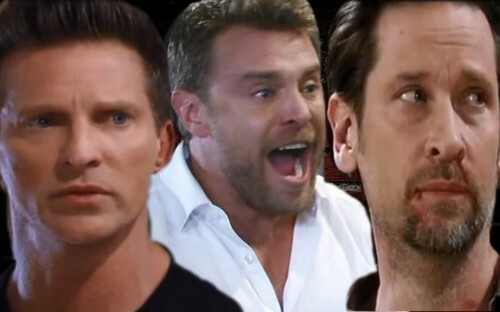 If Miller’s character loses the Jason Morgan title, will he come unhinged? Could the Bad Seed actually attempt to murder Burton’s Jason? It sounds like some hot drama’s on the way. We’ll give you updates as other General Hospital news comes in. Stick with ABC’s GH and don’t forget to check CDL often for the latest General Hospital spoilers, updates and news.